DEBKAfile’s military sources report that units of the Russian forces which formed a steel ring around the Olympic Winter Games that ended in Sochi Sunday were flown and shipped Monday, Feb. 24 to Russian bases at the Ukrainian Crimean port of Sevastopol, as Moscow refused to recognize the legitimacy of the new authorities in Kiev. Giant Russian Air Force transports and rapid deployment forces were placed on alert at the Rostov on-Don base east of the predominantly Russian-speaking southeastern Ukrainian town of Donetsk. 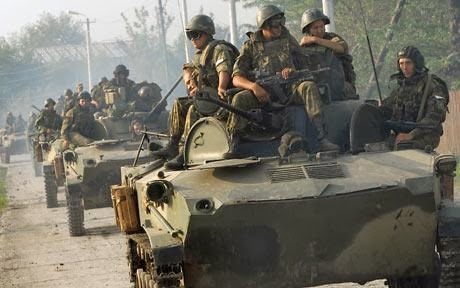 Russian military movements were also sighted near Belgorod, a Russian town 40 kilometers from the Ukraine border and north of its second largest town of Kharkov. There, too, most of the inhabitants are Russian speaking with a strong affinity to Moscow – in contrast to their European-oriented compatriots in the capital, Kiev. These military movements were accompanied by sharp Russian rhetoric in Moscow’s first direct response to the tumult in Kiev and ouster of the pro-Russian President Viktor Yanukovych, against whom Kiev police Monday issued a warrant for mass murder. An area emerging as a potential flashpoint in the Ukraine crisis is the Crimean peninsula in the south. This territory and its port of Sevastopol was part of Russian imperial might from the 18th century until in 1954 when Nikita Khrushchev, an ethnic Ukrainian, transferred it to Ukrainian control – a step bitterly resented by Russians ever since. When Ukraine broke away from the Soviet Union in 1991, it took Crimea with it. Moscow has since leased the strategically critical naval base as a deep-water port for the Russian Black Sea Fleet, with easy access to the Mediterranean. The lease is paid up to 2042. Ethnic Russians make up almost 60 per cent of the population, with Ukrainians and Crimean Tatars accounting for the rest. If Ukrainian turmoil continues and it faces a real threat of breaking up, Vladimir Putin may seize the opportunity to recover the peninsula. The Russian military force in Sebastopol was already beefed up Monday.